The consumer Path-to-Purchase has evolved considerably over the past decade. The growing use of e-commerce, digital innovation, and mobile devices has changed how people shop, and how marketers connect with customers. Mobile and digital interactions leave a data footprint of your customer’s shopping experience, which smart marketers are leveraging as a competitive advantage over their rival brands. In a traditional digital promotion, a user encounters a promotional offer on a deal-seeker coupon site. This digital coupon is often part of a series of offers, often alongside competitor brands. Whether it’s the assortment of offers presented, or the offer itself, there is usually minimal/no personalization to appeal to each consumer. The user can redeem this coupon in-store with a physical purchase; and while the coupon usage is monitored, there is limited campaign tracking and zero online-to-offline conversion data provided. Fraud is another serious issue brand marketers face with digital promotions. Some estimates put the annual cost of coupon fraud at anywhere from $300 to $600 million per year. When considered with limited data tracking, one can understand why many marketers still question the ROI of most traditional digital promotions. What’s missing is a more meaningful, in-depth analysis using data from the customer’s path-to-purchase journey. 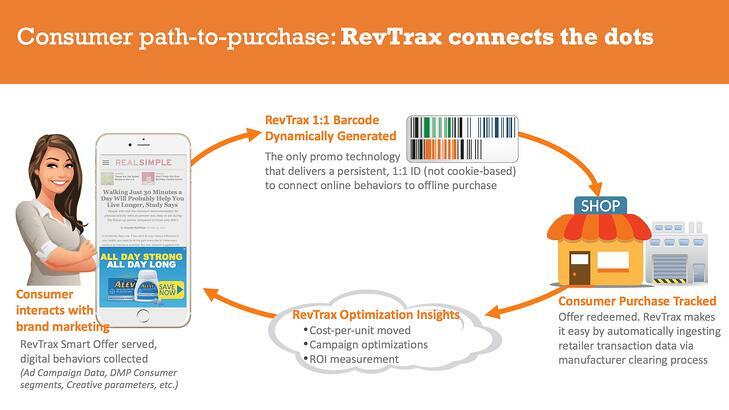 Using a solution like RevTrax, brands can begin to connect digital behaviors to actual purchase. When activated, RevTrax smart offers are coded with key elements of each consumer’s journey (e.g. which campaign/site they are coming from, their DMP audience segment, which creative they were served, etc.). When a customer completes the purchase, retailer transaction data is captured via the manufacturer clearing process, and the marketing team can gather insights that are specific to the consumer and to the promotion. When a company can track a consumer from initial brand interaction through in-store purchase, the path-to-purchase can yield valuable insights for the marketing team. First, you can determine the exact cost of each unit sold during the promotion. With accurate data on the cost per unit, you can then calculate precise ROI for the campaign. This information allows you to make informed, intelligent decisions on future campaigns, which can be optimized to maximize ROI and reduce the cost-per-unit moved. Implementing a smart path-to-purchase tracking system provides an organization the ability to gain a competitive advantage and to streamline future promotions. The more a company can learn about the consumer, the better it can tailor promotions that appeal to that consumer on their path-to-purchase. By connecting the dots with a solution like RevTrax, you can better understand the consumer, build customer loyalty, analyze behaviors, and optimize the marketing mix to garner the best possible results. Learn how to get the most out of your digital Retail promotions — download the Staples case study and see smart consumer insights at work.